The Minister of Regional Development of the Russian Federation Igor Slyunyaev being on a two-day working visit to the Republic of Turkey addressed the plenary session of the 19th annual World Investment Conference of WAIPA. The conference was attended by the Director of the Extrabudgetary Investment Projects Department of the Ministry of Regional Development Shilkina Marina , as well as representatives of the Russian Investment Agency “Invest in Russia” – the President of the Agency Yury Spiridonov, Chief Executive Officer Yury Voicehovsky, Director of Project Finance Department Kirill Amelkovich. 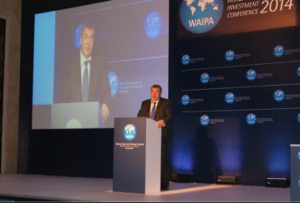 19th Annual World Investment Conference of WAIPA takes place in Istanbul from 13 to 15 May. Every year this event attracts a large number of investment promotion agencies from different countries which are responsible for the investment policy and strategies of their countries in attracting foreign direct investment. The conference this year touched upon the issues related to the consistency of action in the investment policy and strategy for attracting foreign direct investment with developing and well-established sources of investment, with both internal and external directions in the field of investment. Speaking at the conference, Igor Slyunyaev noted that the site provides a unique opportunity to discuss the main trends in the world economy and the global movement of capital, the role of states in creating an attractive environment for business, a joint strategy for attracting direct long-term investments aimed at creating new jobs and modern, high-tech industries. He drew attention to the strengthening of the position of the Russian economy. By the end of 2013 the Russian Federation had received 170.2 billion dollars of foreign investment, which was 10.1 % more than that in 2012. Foreign direct investment was $ 26.1 billion, which represented an increase of 40% with respect to 2012. “This is largely the result of systemic reforms that we have implemented in the economy” – said the Minister. At present, Russia has developed a stable legislation aimed at the protection of property, capital and investment. The tax regime is one of the most liberal in the world, income tax is charged at a flat rate and is 13%. Among the advantages of Russia to attract big business is a large number of highly qualified specialists, rich resources, a well-developed physical and industrial infrastructure, a rapidly growing consumer market. “We should add to the above the high profitability of the business, a stable political system, large markets which will continue to grow with the extension of the Customs Union and the integration processes in the post-Soviet space” – Igor Slyunyaev drew attention of the audience. – Active upgrading of production facilities, implementation of comprehensive state programs for the development of priority mega-regions of Russia such as the Far East, North Caucasus, Arctic, Kaliningrad region and others. “Under the auspices of the Ministry of Regional Development of the Russian Federation it was created the Russian Investment Agency “Invest in Russia”, which is a platform at the federal level for interaction between investors and regions represented by specialized investment agencies in the regions of Russia. It is extremely important to interact with international organizations – the World Association of Investment Promotion Agencies (WAIPA) and foreign institutions in order to attract investment. We hope that the experience of WAIPA, the technologies, the standards of investment activity will help us to create favorable conditions for mutually beneficial business in Russia”, – said Igor Slyunyaev. In his report the Minister of Regional Development stressed the importance of Turkish-Russian economic relations. By the end of 2013 the trade turnover between the countries amounted to 32.7 billion dollars, while the volume of mutual direct investments as a result of last year was estimated at the level of 1.5 billion dollars. Joint investment projects were implemented in the field of energy, agriculture, electronics and electrical industry, automotive, building materials, services and tourism. This year the construction of gas pipeline offshore section “South Stream” begins in the exclusive economic zone of Turkey, “Rosatom” builds the Turkey’s first nuclear power plant “Akkuyu”. At present the feature of the investment of Turkish companies is the transition of investments from areas of large cities to regions – particularly in Moscow region, Smolensk, Vladimir and Ryazan region, the subjects of the Southern Federal District of Russia. “Taking into account the growing role of Turkey in the global economy, we support the idea of ​​moving the headquarters of WAIPA to Istanbul. The motto of the new strategy of WAIPA is «Moving Forward!”. I hope that this movement will be together with Russia and that due to our active cooperation even more investment will come to our country, more and more companies will throw their anchor in a safe harbor of the Russian state”, – summed up his speech Igor Slyunyaev. The management of the Russian Investment Agency participated in the voting held at the conference on the location of headquarters of WAIPA. By the majority of votes it was decided to move the Head-office of WAIPA from Geneva to Istanbul. As part of the first day of the visit to the Republic of Turkey the Minister of Regional Development of Russia Igor Slyunyaev had meetings with the Director of “GAP Ishaat” Alkas Bekisoglu, the Vice President of “Gama Holding” Ozan Arif, the Head of “Kalyon Insaat” Orhan Kemal Kalyoncu and some other Turkish business structures. During the talks, the Minister and the members of the official delegation of the Ministry of Regional Development discussed with Turkish partners the opportunities for collaboration and cooperation in a wide range of areas.